Well...I was being good. 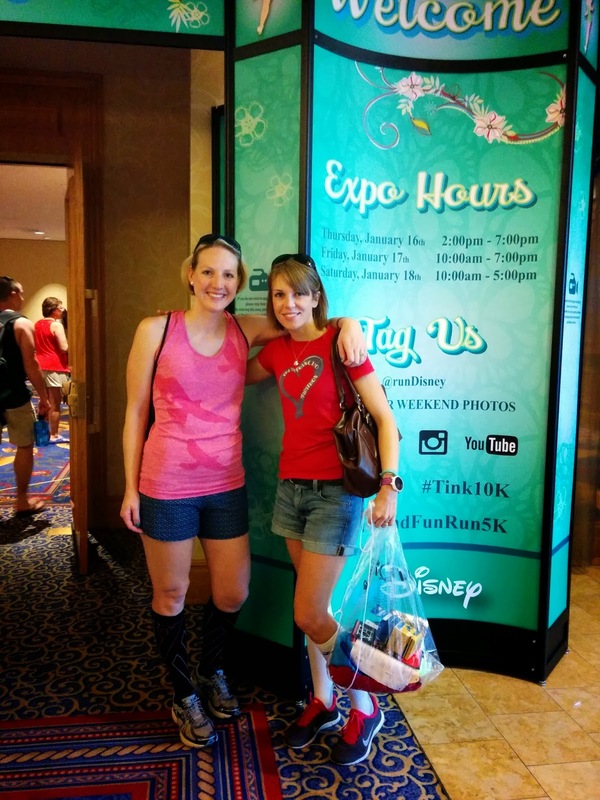 Until I arrived at the Tinkerbell Half expo. Yes, I got caught up in the excitement and decided to do the event, of course taking it much easier than I planned when I registered. The doctor had given me suggestions on what to do if I decided to run, warning me to watch for pain and that it might slow recovery a bit. I was past my 2 week no run window and the race was flat, so the doctor didn't think it was out of the question if I wanted to do it. Even though I know I'll pay for this one in the recovery process, I'm really happy I decided to run the race because it was fantastic. Walking to Disneyland. 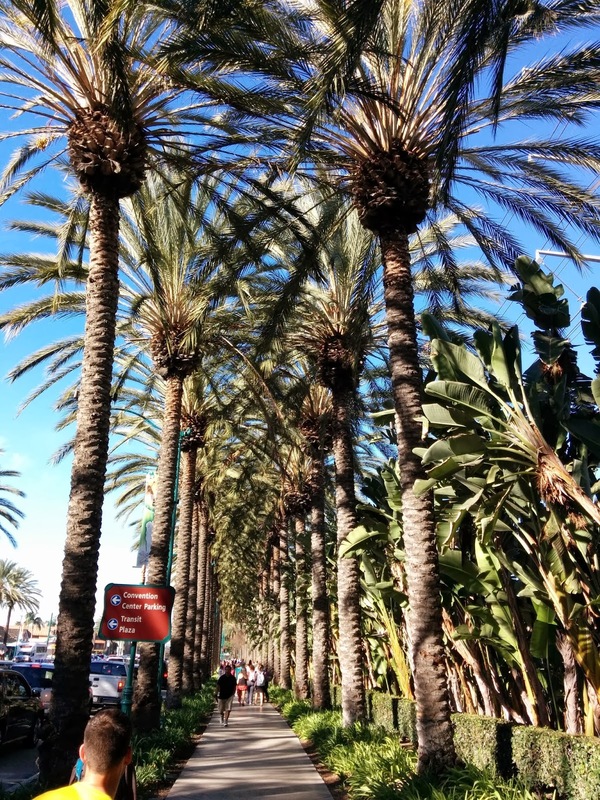 Love the palm tree lined sidewalks. 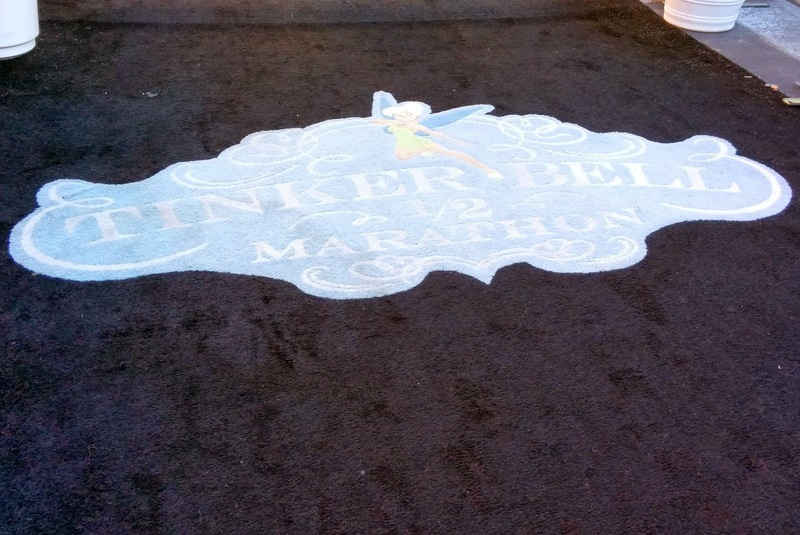 Tink Half carpet into the expo. Obligatory Sleeping Beauty Castle photo. Pretty! 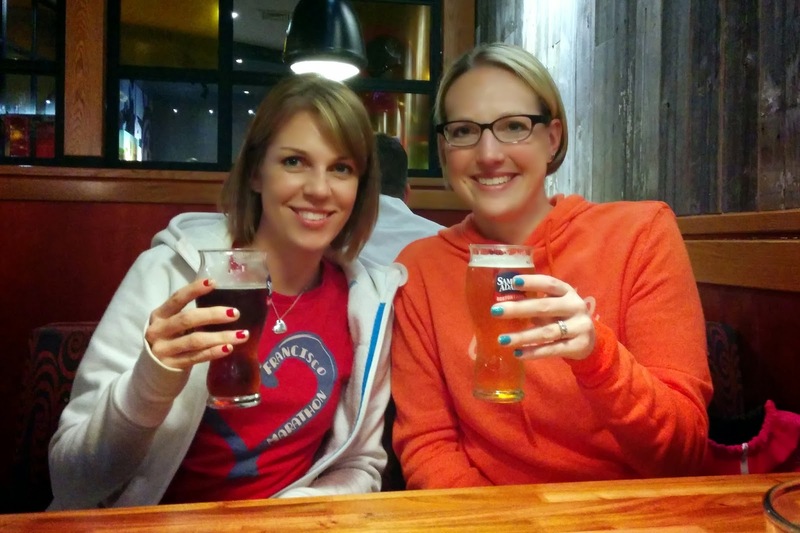 After the park, we enjoyed dinner with Meg's parents at Red Robin (pre-race burger and beer is perfect!) and went to sleep early. That 5 am race start is a tough one. Race morning arrived with a 3:45 am wake up call, and I was able to get up much more easily than I expected. We got dressed, had breakfast, and walked the mile+ to the start line. I felt so special walking all the way up to corral A! That isn't a normal race corral for me. The race start had a few really nice effects - fireworks during the Star Spangled Banner and Minnie and Daisy for the official start. Super cute. The first 5-6 miles of the race were through California Adventure, Disneyland, and backstage areas. It was awesome. They had the World of Color fountain show going in California Adventure which was beautiful, and the parks were lit up in the dark with rides running and characters everywhere. After winding through the parks, we headed out into the city of Anaheim for a few miles. Even this part was fun and interesting; the course was great overall. The last couple of miles went back into the parks and then to the finish area outside of the park hotels. Compared to the Disney's Princess half in Orlando, this course was more than one hundred times better. The Orlando course only had a couple of miles in the parks, then SO many miles on highways. 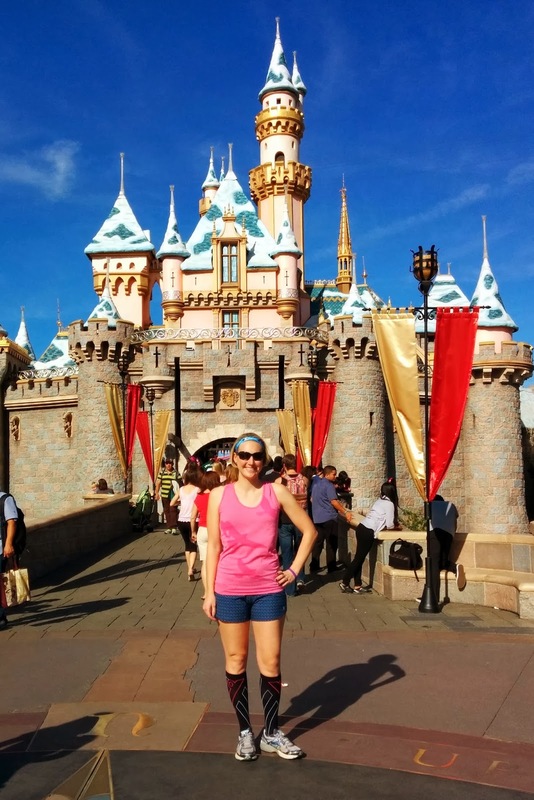 It's unlikely I'd run another race at Disney World, but I'd definitely do Disneyland again. As far as the running part goes, I took it at an easy pace and made myself take some walk breaks to slow the pace down. My leg really didn't bother me during the run, and I was able to finish feeling like I had done an easy pace long run. 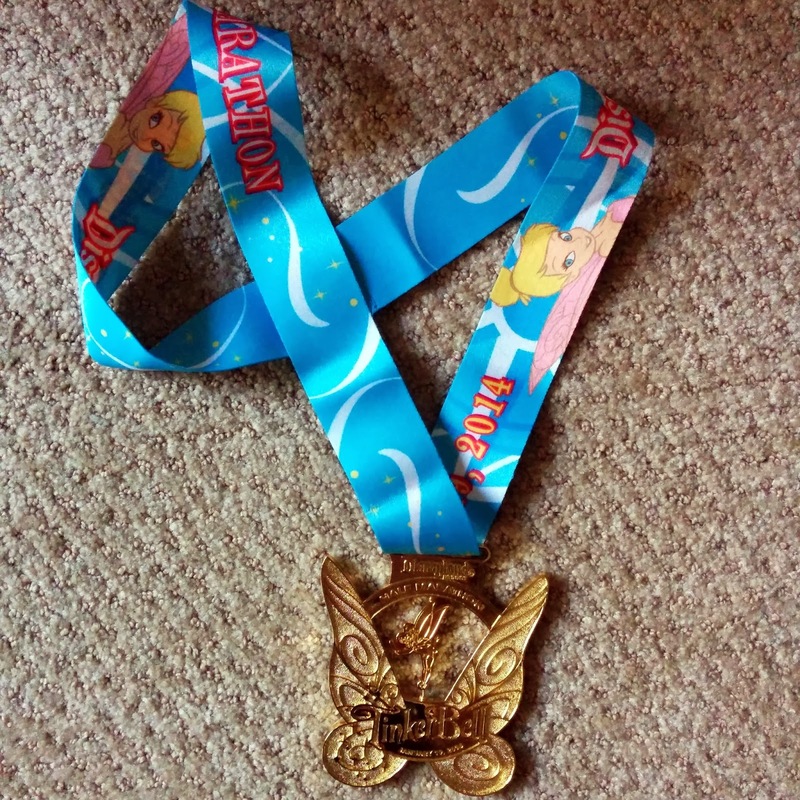 I crossed the finish at 2:15:15 and happily collected my fancy Tinkerbell medal. I love the Disney bling! Support. Disney definitely knows how to do a race. There were aid stations with water and sports drink very often, maybe every 1.5-2 miles. 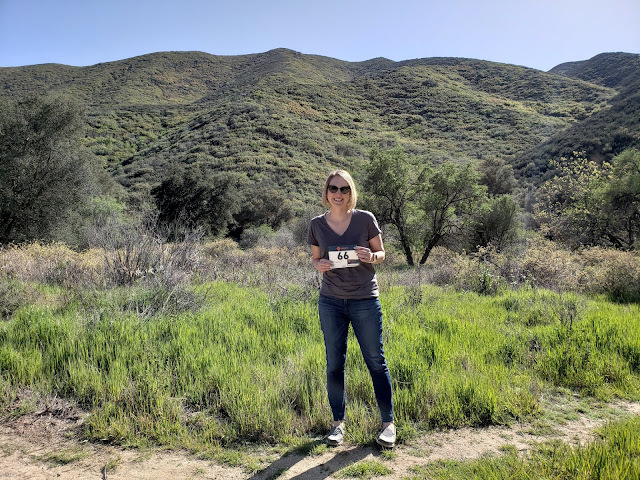 They handed out Clif Shot gels once on the course, and there were plenty of opportunities for medical and porta potties as well. The volunteers seemed to be having fun and there were tons of people cheering! One of my favorite sections was the seemingly endless street of Red Hat ladies who were seriously enthusiastic. Even though it was early, people were out in the parks and on the streets of Anaheim to cheer. At the race start, they had each corral start separately and were very picky about having people start in the correct place, so I found it to be very smooth and not crowded. The Finish Line. The finish area was the most anti-climactic part of the event, but it was sufficient. After crossing and getting the heat sheet and medal, we walked through tents where they handed us a small box of food and bottle of water and/or Powerade. It was efficient, but also felt like it lacked in amount of finish area offerings. What can I say, I love a finish line beer party! Not that I expected this at Disney of course. The box included a banana, hummus, chips, fruit chews, almond roca, and soy nuts. Another really cool thing to note is how Disney handled people wanting to cross streets. They had someone with a rope that directed runners to the right or left side of the road, and when runners weren't in that lane people walked to a section in the middle. Then, the rope person switched runners to the other side and people finished crossing the street. It was pretty slick I have to say. 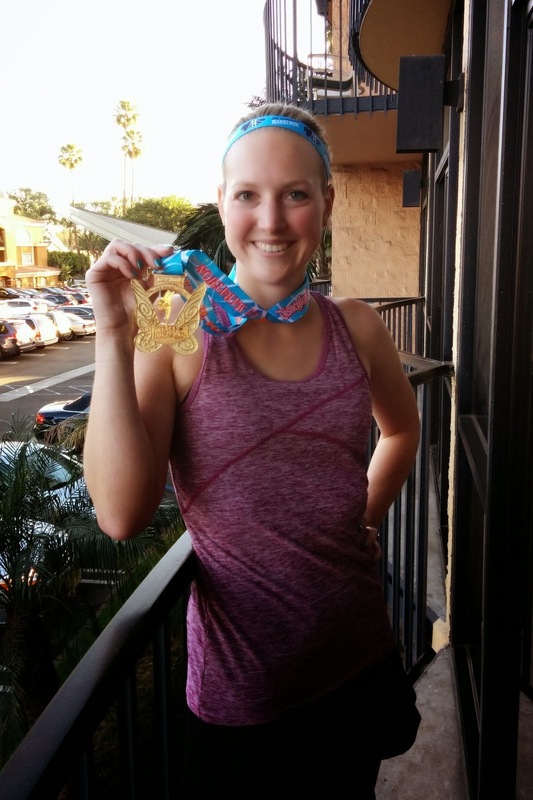 That's all for this race report, but be sure to check out Meg's recap too! 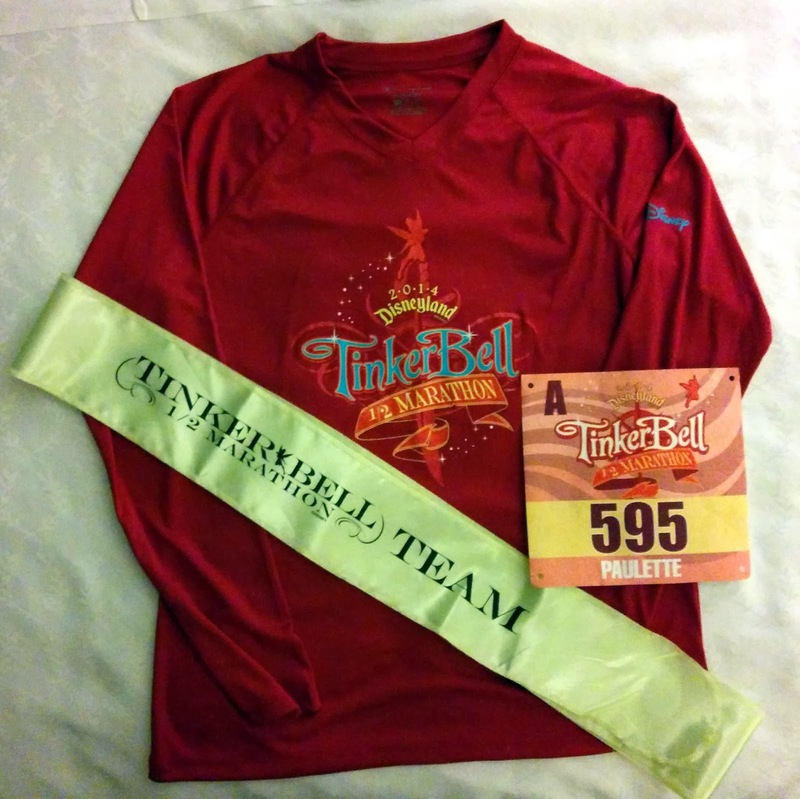 Great job on the Tinkerbell Half!! I've done plenty of races at Disney World but I haven't been to Disneyland yet. Maybe with Tink moving to May it may be feasible next year (and then I could get my Coast to Coast)! haha, I love reading other people's take on DL vs WDW - since I grew up close to WDW, I feel like that park is more "home" to me, and I ALL-CAPS LOVE those courses, but only lower-case love the DL courses. I'm so glad you had a fun race, and were able to run! Here's to quick and happy healing soon! I'm so glad you made it through without hurting yourself! I'm also super jeally! I love Disneyland! I had a season pass when I lived in SoCal. The races look fun and have the best bling! Great job on Tink. I'm glad you were able to run. I was not a fan of my Tink shirt from the inaugural race because it was white. Good to see Disney went with a different color this year. Glad your leg felt ok! I would've had trouble watching from the sidelines too, especially since you were already registered. Sounds like a fun event! I have been wanting to do a Disney Race for a while now but I just seem to forget when they are and don't have the means to fly to Florida. I'll have to stay on top of the Anaheim park :) Glad your leg felt well enough for you to run. You still made great time!